I used gstone dust clayhto make a doll. It was too hard to form small parts. So I used glight clayhalso. I mixed two types of clay. I used acrylic color to paint the doll. Many professional doll artists use oil paint because it has beautiful color. But I don't know how to use oil paint. So, I thought acrylic color is better for me. I used gmodeling pastehfor coating. gmodeling pastehis a medium for acrylic painting. Japanese traditional paints ggohunh may be the best for a dolls. But it was expensive and too much for me. It is a kind of powder of oyster's husk. I used gPastelh for making the doll up. Wire was used to form hooks which jointe the balls and the parts. Stainless steel is best because it doesn't rust. 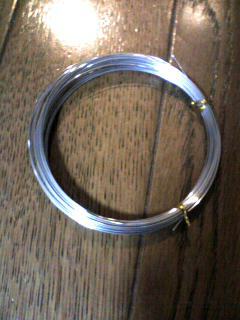 I bought the wire at a 100 yen shop. Elastic was used to suspend parts together. 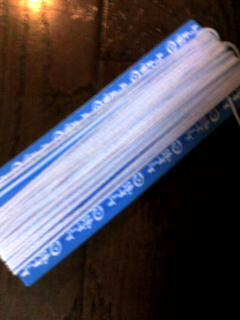 It is 100 yen shop's too. Beads is substitutes for small joint balls.